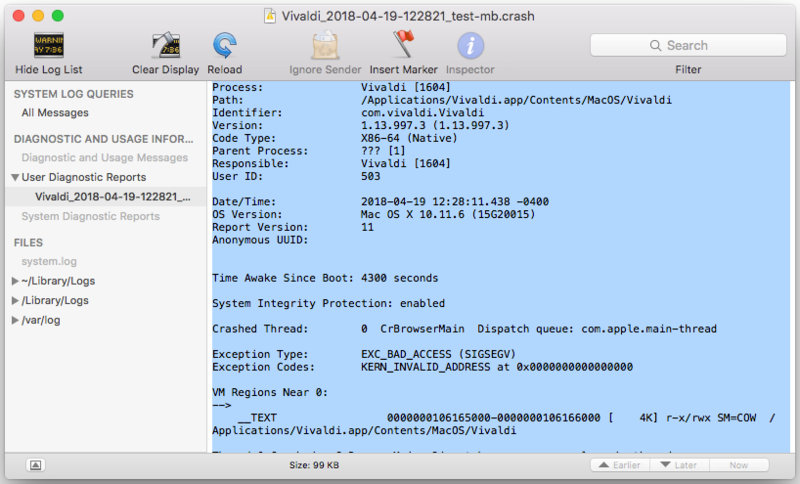 A “crash” occurs when Vivaldi encounters an unrecoverable error and shuts down unexpectedly. Information pertaining to the crash is logged by macOS. Crash logs are not sent back to us automatically. However, you can create a bug report and forward us a copy of the crash log manually, should you wish to assist us in resolving the issue. Such logs are greatly appreciated; they provide us with information as to exactly where in the code things went wrong. Next, open “User Diagnostic Reports” in the sidebar to see the list of crash reports. Click on a Vivaldi crash report, then select and copy all text shown in the viewer pane. Open TextEdit (or your favourite word processing application), paste the text from the crash report, and save it as a text file. 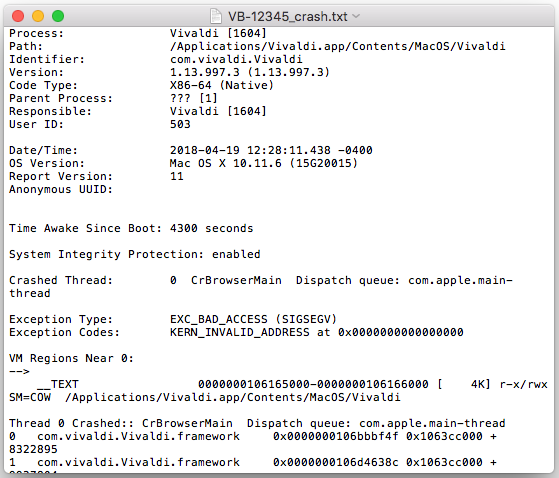 Open the Vivaldi bug report page and provide any details you feel may be associated with the crash (e.g. the website you were viewing). To send us a crash log, you must provide us with a valid email address. Shortly after submitting your bug report, you should receive an email from us confirming that it has been logged. Please reply to this email with the crash log(s) attached.